A mother who makes hand-made crafts in memory of her daughter to raise money for Rainbow Trust Children’s Charity, which supported her whole family, has said her daughter would be proud she is helping other seriously ill children. Working from her daughter Amy’s bedroom, which has remained unchanged since she died aged 13 in 2016, Lisa Stockill spends her spare time making personalised gifts, keepsakes and memory boxes in aid of Rainbow Trust and CLIC Sargent. Her designs, which also include glassware, peg dolls, wedding and christening gifts have so far raised around £1,000 for Rainbow Trust. “Amy will be looking down and be proud of what I’m doing and that I’m helping other sick children as well,” Lisa said. Family Support Worker Sabrina supported the Stockill family at home after Amy finished her hospital treatment and helped Amy’s older brothers Shane and Christopher come to terms with Amy’s diagnosis. When Amy passed away suddenly on 8 February 2016, after being in remission with a brain tumour for nearly two years, Sabrina provided bereavement support for the family. Lisa wanted to give something back to Rainbow Trust because they made such a vital difference. After Amy passed away, Lisa was left with a void in her life and she began making cards. Friends encouraged her to continue and she started Amy Jayne Crafts last July. “I went from being full on for two years at hospital with Amy and looking after her all the time to nothing,” Lisa said. 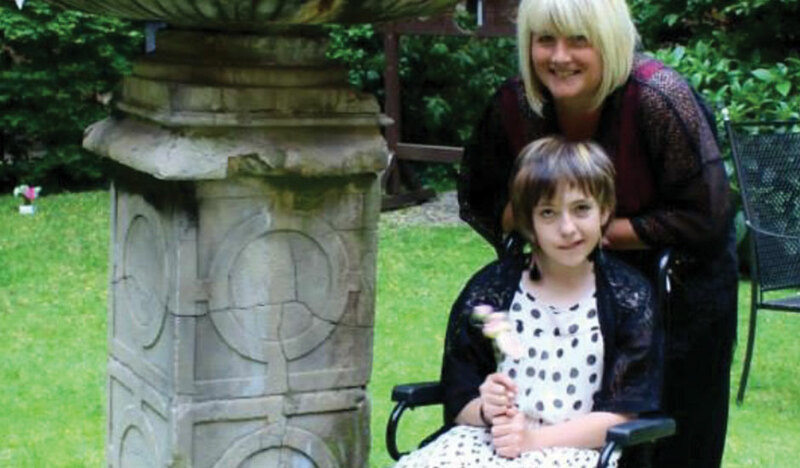 The idea of setting up Amy Jayne Crafts was born out of the mother and daughter’s shared love of creativity and a conversation between them about what activities Amy could pursue after the brain tumour she had been diagnosed with at the age of 10 later confined her to a wheelchair. Keeping Amy’s memory alive through her crafts has been a great comfort to Lisa and her family. A memory box she designed for Amy in her favourite colour purple, with pink butterflies, has proved popular with customers as has a photo frame depicting a personalised family tree. “I’m really enjoying making crafts,” Lisa said. “I want Amy Jayne Crafts to get bigger and bigger. It’s really important people raise money for charities such as Rainbow Trust. When you are faced with a situation where you have lost a child or your child is going through treatment all your focus is on wanting that cancer to go away,” Lisa said. Lisa is still in touch with Sabrina and she cherishes the memories of their time with Amy. Anyone wanting to support Amy Jayne Crafts can visit Lisa’s Facebook page.